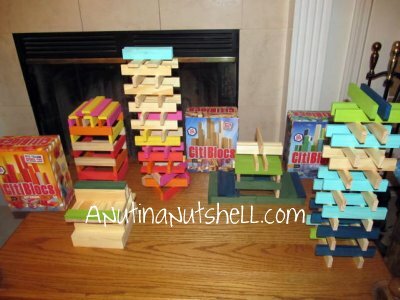 No matter how old you are, construction toys and building blocks are irresistible! I’ve spent countless hours building things with my kids through the years. 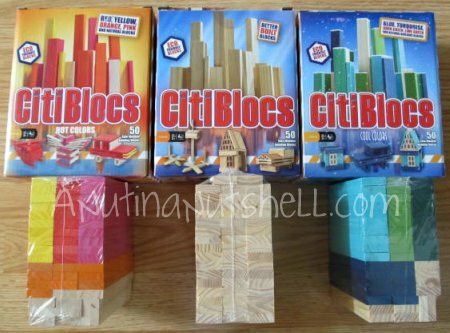 But it wasn’t until I started blogging that I discovered Citiblocs – classic blocks with a modern spin. They’re different from any other blocks I’ve seen. They’re all exactly the same size and perfectly balanced. 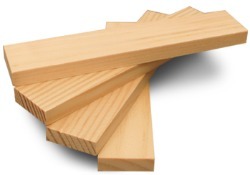 They began as all-natural pine blocks, but now they’ve introduced some fun new color combinations. There are Hot Colors (red, orange, yellow, pink and natural wood) and Cool Colors (turquoise, dark blue, light green, dark green and natural wood). I love anything where imagination and creativity are in charge, so I couldn’t wait to bust into these blocks. The best part of construction toys is that nobody judges you. There’s no right or wrong; you just build. Don’t you just love the vibrant new colors? If you’re feeling ambitious, there are a whole bunch of building ideas in the accompanying booklet and on Citibloc’s website. Some of the creations are really challenging, which makes the blocks fun for the littlest ones and for their parents! I found this choo-choo train online and just had to make it! It might look easy to make, but it was tricky! Citiblocs have received over 30 industry awards, and it’s no wonder. I definitely see the appeal. They’re fun! Buy It! You’ll find Citiblocs in every color and size at Amazon ! They’d make a wonderful holiday gift! One lucky winner will win a 100 piece set of Citiblocs in their choice of colors – Natural, Cool Colors, or Hot Colors. A media sample was provided for this review. The opinions expressed in this post are my own honest thoughts on the product. I would choose the all-natural coloerd blocks. I would like the all natural. I’d love the Hot Colors! I would choose the Cool Colors. I would choose the hot colors. I would pick the cool colors. All Natural would be my choice. I would love to win the Cool Colors! I like the cool colors set. The Cool Colors- It’s a boys world around here. My pick would be the Cool Colors! I love the Hot Colors! I would love the Hot Colors! All-natural. My kids had building blocks when they were young and I wish I still had them now that they have kids. I would love the Cool Colors. I would like the Hot Colors. Cool!!! My girls would love them!! I would love to have the Hot Colors. I would like the cool colors. Cool colors. My son would love these! I’d go for the hot colors! The cool colors! These would be so much fun!! I would choose the cool blues. I’d pick the cool colors! Blue & Green are my favorite colors! I’d pick the Cool Colors! I like the Hot Colors. I would choose cool colors! I’d like the all-natural citiblocs! cool colors would be my pick! girly pink, red and orange! I like the dark blue, light blue, and lime green. I’d like the Cool Colors. Id definitely love the cool colors! I like the cool colors! I’d love to get the Citiblocks in Cool colors! I like the hot colors! They have a kick to them. I would choolse the hot colors for my little girl! Thanks for the great giveaway! All natural would be perfect for my boy girl kids. I think I’d choose natural. I’m going with Cool Colors on this one. Definitely the cool colors! Great giveaway! I would go with Cool Colors! I love the Cool Colors! I definitely want the hot colors … I’ve got girls that would enjoy these. already a big citi blocks natural fan so i’d love to try the hot colors. I would choose the cool colors – but they all look great! I like the cool colors. Think I will have to pick the cool colors as mostly likely they would end up being for Lucas. What a great giveaway! We LOVE our Citiblocs! Ours are the camo colors, so I think I would choose the cool colors to blend in. Both kids are obsessed with them! I would choose the cool colors set. I would choose it in cool colors. would love to win the cool colors for my son for xmas!! 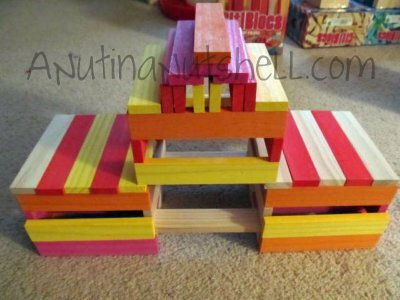 I would choose the ‘hot’ colors…we’ve got 2 girls and a boy, and they would all go crazy over these blocks! All natural! The colors are pretty, too, but the natural ones remind me of when I was little. These look like so much fun! I would love to win the Cool colors. I would choose the Hot Colors! Thanks so much for hosting this great giveaway! I would like to get the Hot Color CitbBlocs for my daughter. I would choose the natural ones. i would pick the cool color! I’d like to win the cool color set! I like the cool colors. Thanks for the chance to win! Cool Colors is my choice. i love the cool colors!!! I like the hot colors! Thanks so much for the fantastic giveaway! I think I’d choose the cool colors. These look awesome! I think I’d go all natural! My preference is the All-Natural color. Thanks for the giveaway! Ooh the cool colors are the coolest. I would chose the cool colors, of course. Thank you for this giveaway! i like the all natural blocks! Would like to go more traditional and the all natural. Thanks for the fun. I like the all-natural color blocks! If I had to choose, I would choose “cool”; but, in all honesty, we’re not that picky! My daughter would love all of them! I would love the warm colors!